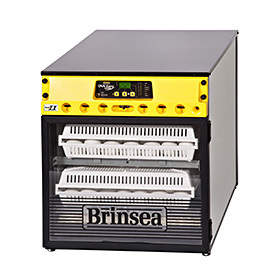 This separate matching hatcher is the ideal complement to the Ova-Easy 190, 380 or 580 Advance cabinet incubators. Hatchers are preferred by those who incubate heavily. Three days prior to hatch, incubating eggs are moved to a hatcher due to the different conditions eggs benefit from at that point, versus the prior nineteen days of incubation. Like its brothers, the OVA-Easy Hatcher is designed to offer the best possible performance at very reasonable price. Each aspect of the design has been reviewed with this objective in mind to ensure that no other hatcher available can give you so many healthy chicks for so little money. INCLUDED FREE: set of 4 covered hatching trays, a $120 value.